The Italian province of Padua is a treasure chest of extraordinary richness with its walled medieval cities, art, hills, lakes, and castles. These are all linked by waterways with beautiful bicycle trails that we were quick to take advantage of. 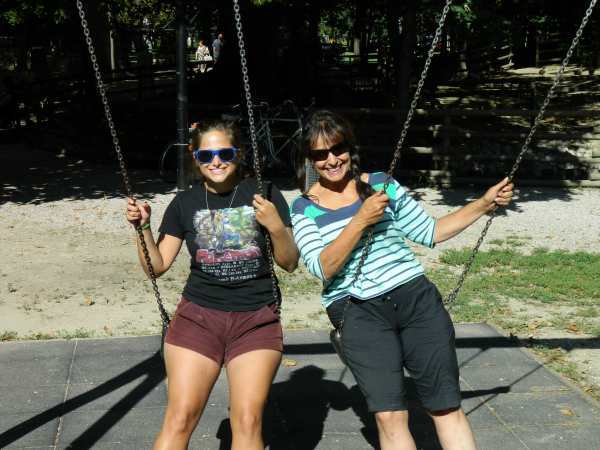 All three of us us biked to the neighboring walled cities of Monselice, Este, and then Montagnana, following the canals and waterways that flow through the province. Each of these beautiful medieval cities contained one or more traffic-free squares. 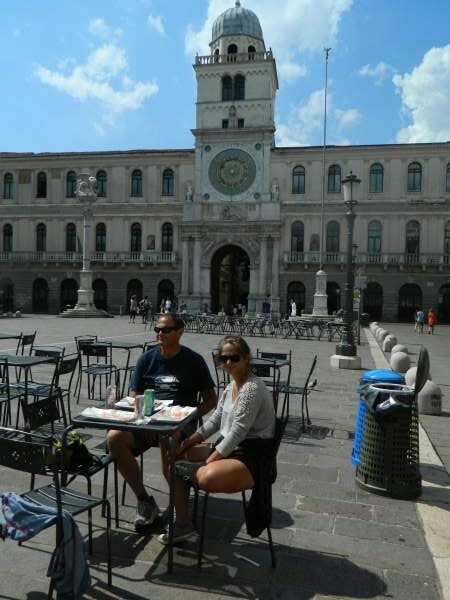 Town squares are an ancient concept that continues their usefulness today. These squares are often about the size of two football fields, and are lined with cafes, restaurants with outdoor seating, and shops. They are great places for meeting people, lingering over a cup of coffee (or for Giana, lingering over a Spritz), or for watching people out for their evening stroll. 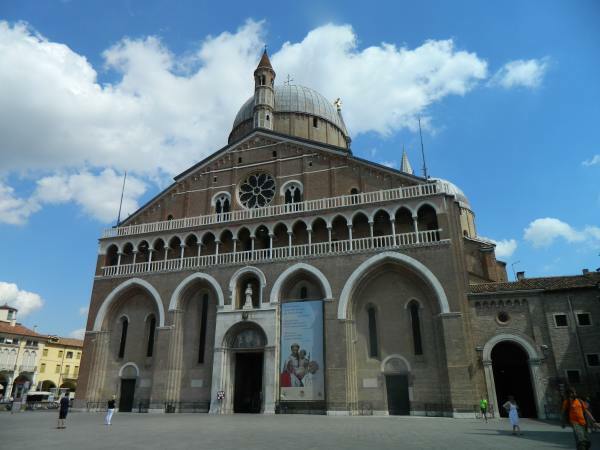 Basilica of Saint Anthony, Padua – the relatively plain red brick exterior, guarded by Donatello’s life-size equestrian statue, did nothing to prepare us for the incredible beauty inside of the Basilica of Saint Anthony. Each of us agreed that it was the most beautiful, and spiritually moving church we had visited on our trip. Pictures were not allowed inside the basilica at all, and I am unsure if they could do it justice anyway, but no words could describe the vibrant colors, the intricate stained glass or the gleaming white marble tomb of Saint Anthony himself. As we entered, we saw Donatello’s crucifix, as well as seven other statues by the great Florentine sculptor who spent more than ten years of his life creating the altar. After reflecting on, and appreciating the use of space, light and color, we made our way to St. Anthony’s tomb. This entire area was carved in gleaming white marble, and included nine reliefs showing times in the life of the saint. These clearly demonstrated the Renaissance mastery of realism as each of the 3-D faces showed vivid emotion, and each frame was intricately carved. 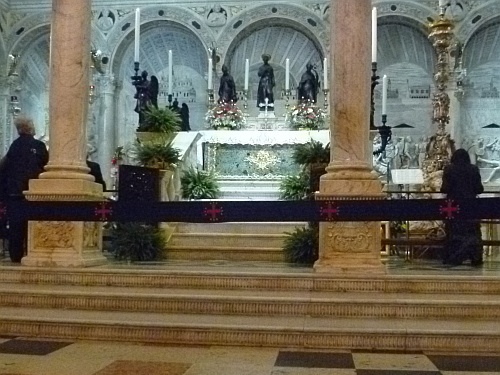 The saint’s remains have been contained in this tomb for over seven centuries. There were three other chapels inside the basilica that were each impressively painted from the year 1500 to the year 1700. Stained glass windows added to the majesty of each chapel. Each of us felt blessed to have been able to visit this impressive medieval church. 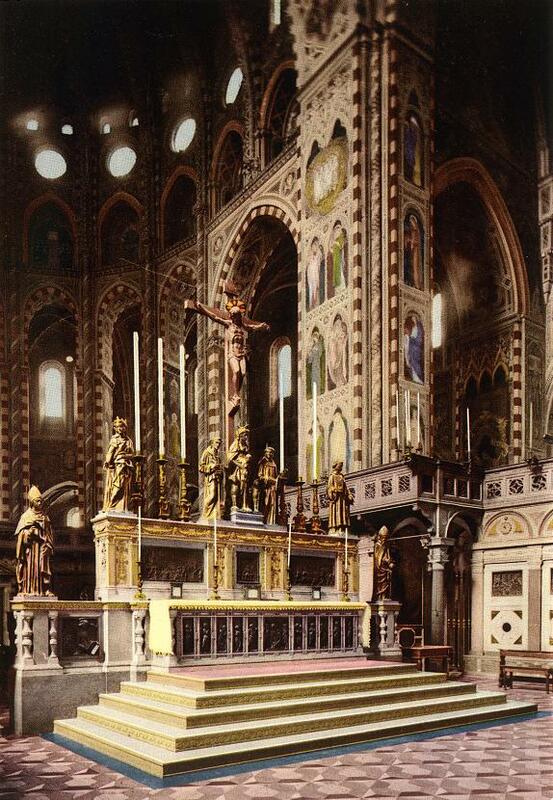 Google image of the interior view of Donatello’s crucifix. 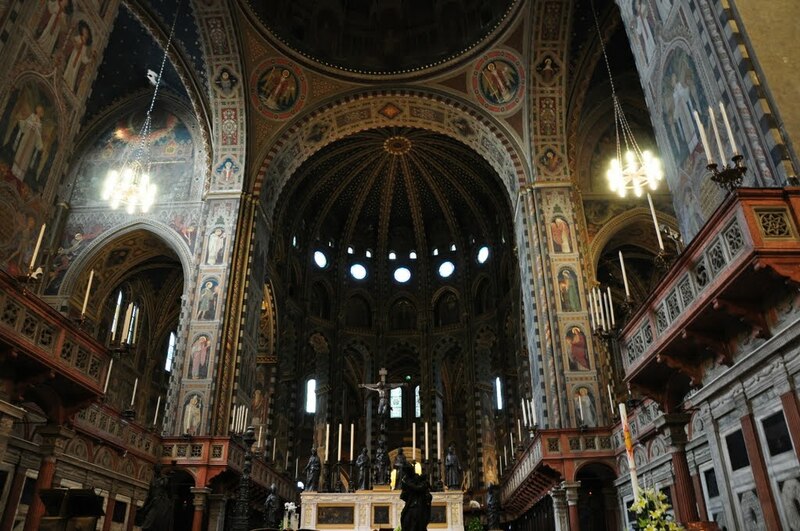 Google image of the Basilica of St. Anthony’s interior. The picture does not show the vivid colors well. We were sad to leave this beautiful and friendly area for several reasons. We enjoyed our time here, but sadly it was time to return to Venice to take Giana to the airport so she could return to Berkeley for classes. 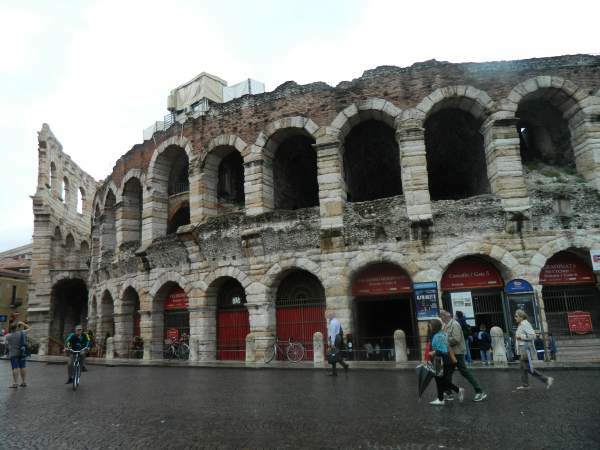 Our next stops (sans Giana) would be the Verona, the real-life setting for the fictional story of Romeo and Juliet, and then off to the Dolomites in Northern Italy. This town boasts about being the real life setting for the story of Romeo and Juliet with its feuding families, the Montecchi and the Capellos as models for Shakespeare’s Montagues and Capulets. We spent time visiting its Roman ruins including an arena built in the same fashion as the more famous Colosseum in Rome. 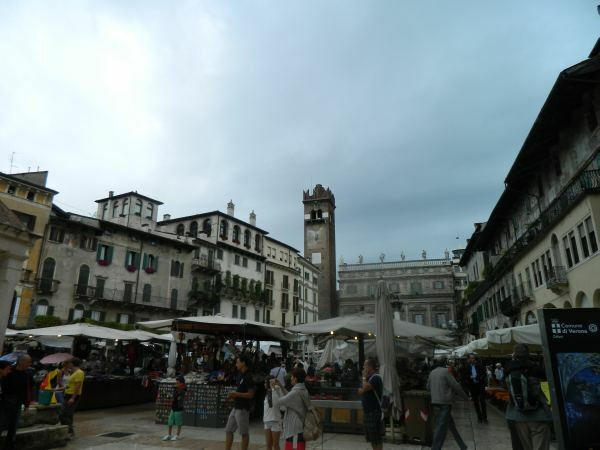 One of Verona’s many squares and outdoor markets. The Perfect Day – We arrived at a campground that had unbelievable views of the mountains and the valleys below. The camper sites were full, but they made room for us in a spacious tent site with views of the Dolomites looming in the background. After settling in, we walked to the next town on a dirt trail that cut through the forest and afforded us beautiful views of the valley below. 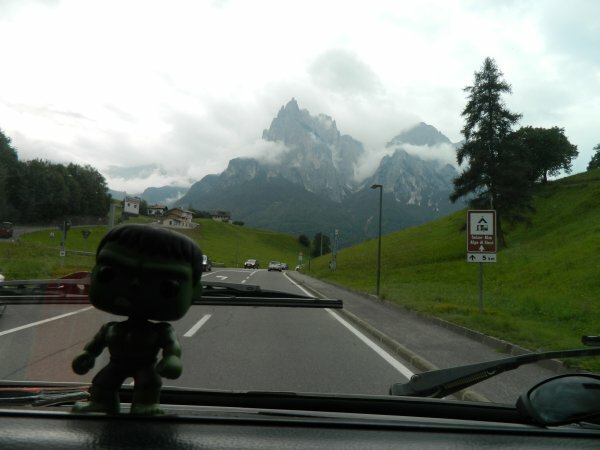 When finally we arrived, we rode on an Areial Cableway (an enclosed ski lift ) to the Alpe di Siusi. 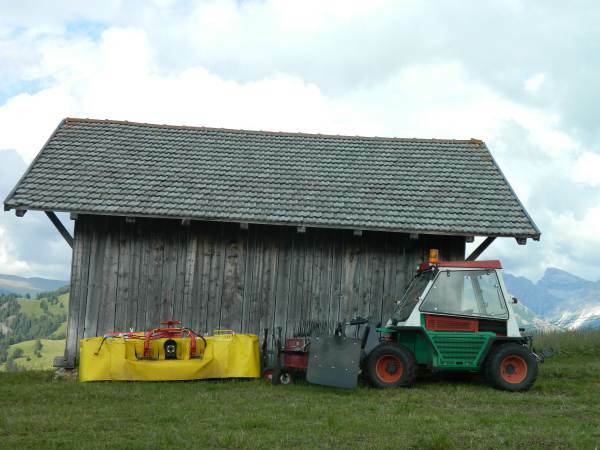 It lifted us 1000 feet to Europe’s largest alpine meadow. 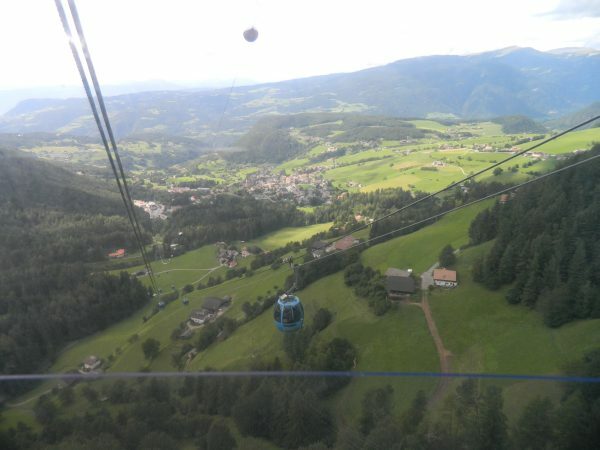 View from the Areial Cableway on our ride to Alpe di Siusi . 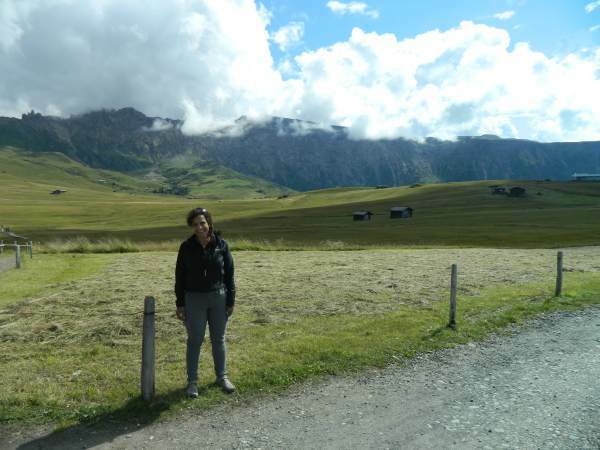 See photo gallery for more pictures..
View of the alpine meadow, Alpe di Siusi. If you listen closely you can almost hear Julie Andrews singing the Sound of Music. 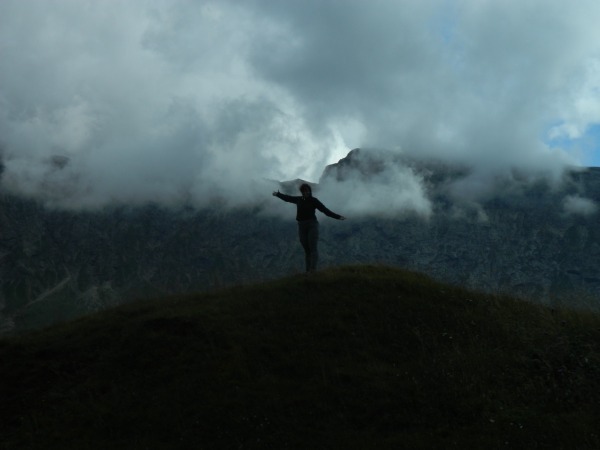 To our pleasant surprise, the Italian alps are home to a great deal of agriculture. 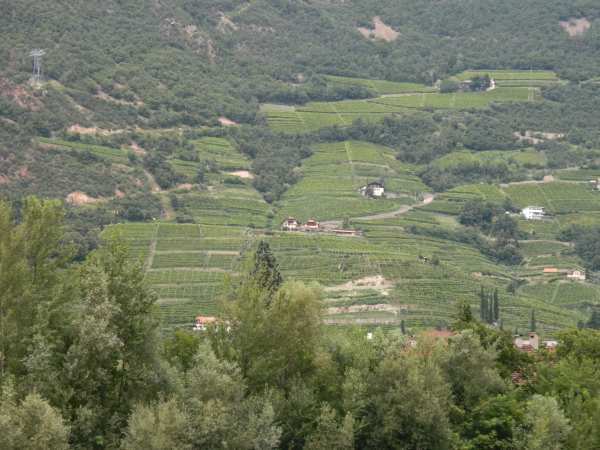 Small dairies, grape vineyards and most of all apples cover much of the arable land within this beautiful area. 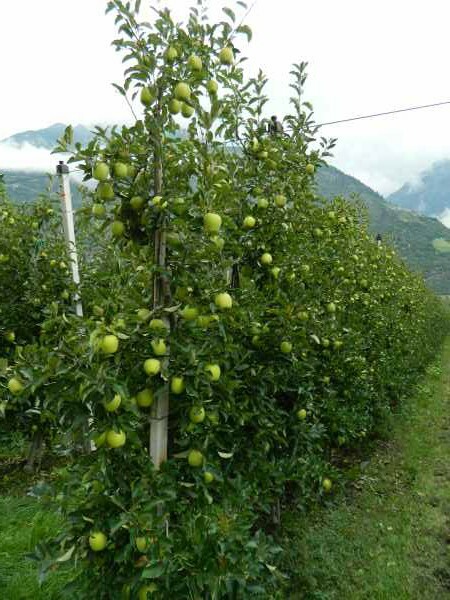 In fact, the Alps are believed to have more than 20,000 family growers growing 28,000 hectares of apples (nearly 70,000 acres). It’s hard to image until you see it, apples are everywhere you look. We were lucky enough to be traveling during harvest and were able to observe the operation first hand. In addition to apples, we found it fascinating to see small dairies scattered throughout the area. Cows graze in pastures as high as 6700 feet in elevation during the summer, and are then moved lower during the winter (unsure if it’s for the cows sake or to make room for the skiers). We watched as a local farmer bailed grass hay and two workers followed behind with hand rakes making sure not a blade was missed. It is a different type of agriculture than we are used to, but meets the needs of the family farmer. Hedge row apples with shade covering. 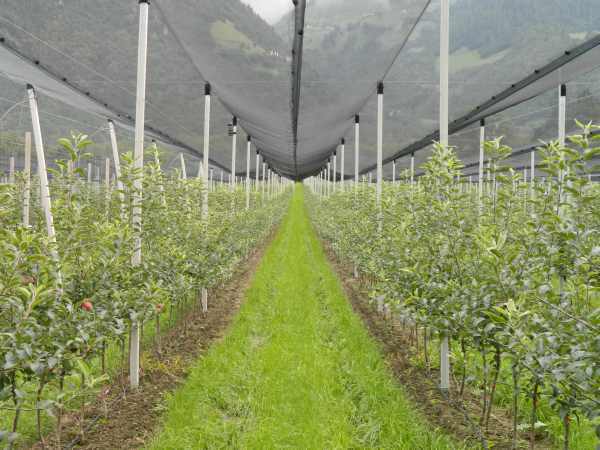 Most of the newer orchards were this type of planting. Mature planting utilizing both inline drip irrigation as well as overhead sprinklers. The most scenic pasture I have ever seen. Continuing to really enjoy your postings and descriptions!!! You are making it come alive! Thanks Tina, I hope all is well with you and David. Right at 250 miles and only one skinned knee. Lots of ibuprofen though.